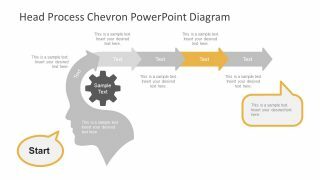 The Head Process Chevron PowerPoint Diagram is a creative brainstorming presentation template. The human head silhouette which turns into a chevron icon displays the step-by-step process of working with ideas. It contains 5 chevron process flow moving from right to left in horizontal timeline diagram template design. 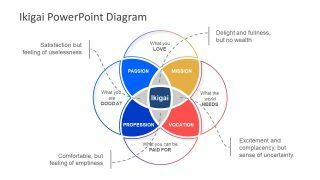 It is a generic PowerPoint tool, suitable for various business presentation in range if industries. Because the shapes and icons of head process diagram PowerPoint are easily interpretable by everyone into similar sense. 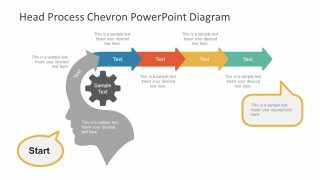 These basic arrow shape chevron icons, human head and gear can supplement any PowerPoint effectively. 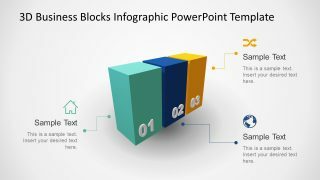 Additionally, these PowerPoint shapes are flat vectors, giving a professional look and feel to the overall concept presentation. The Head Process Chevron PowerPoint Diagram is a simple model with text placeholders to add the relevant details. 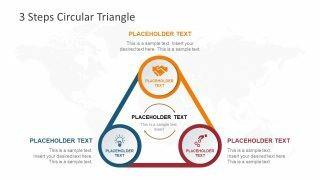 Moreover, the flow diagram template assists the users to personalize graphics or an overall theme effortlessly. For example, alter the theme from design menu, select a desired pallet or format background. Similarly, make changes in the chevron and human head silhouette from drawing tool menu. This drawing tool offers range of customization options including colors, styles, and arrangements. While the presenters can insert their data into the placeholders. 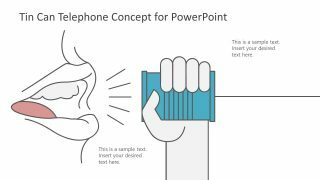 They spend less time on design and more time on preparing the speech. Therefore, the head process chevron as data flow diagram ppt can save presenter’s time by fraction. The Chevron process diagram PowerPoint has gear inside the human head silhouette. Which could metaphorically portray brainstorming session, thinking, or analysis report processes. Further, the gear icon suggests an ongoing process and a system in place to perform specific task. 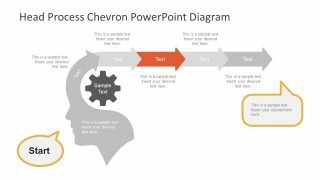 The head process and chevron layout of PowerPoint diagram can also help in creating impressive learning presentations. For instance, the chevron steps can display guidelines or instructions to perform a task. Such as providing the simple step-by-step process instructions on how to apply for library pass.